I originally developed the C-Wheel to use on teacher education courses in order to help develop awareness and understanding of ways to create optimal conditions for children’s learning, whatever the age. My aim was two-fold: firstly, to provide a flexible tool which could be applied to many different teaching and learning contexts, and secondly, to suggest that by adopting an approach in which we take account of the whole child, we are likely to be more effective and successful in our work as language teachers. Context: the context for learning needs to be natural, real and make sense to the child. It also needs to support learning and allow for the active discovery and construction of meaning. Connections: we need to build in connections to other areas of learning, e.g. science, as well as to the child’s own real life experience and language, and how these compare and contrast with English. Content and Culture are therefore two further ‘C’ ingredients that come in here. Coherence: we need to provide carefully linked opportunities for children to acquire and learn language in ways which are meaningful and comprehensible, and to ensure that the reasons for doing things are perceived as relevant and worthwhile. Challenge: we need to develop thinking skills as well as language skills and there needs to be an appropriate balance between linguistic and cognitive challenge. Cognition is therefore another ‘C’ ingredient which comes in here. Curiosity: we need to arouse and maintain children’s curiosity and make the act of learning interesting, relevant and enjoyable in its own right. Curiosity can extend to topics and content from other areas of the curriculum, as well as to other people, cultures, literature and language itself. Care: this includes treating children as individuals, supporting their learning appropriately and using positive language – some of the areas already discussed in the previous two posts. Community: children need to feel part of a community in which they feel valued and secure, and participate willingly. Community is the superordinate for three other important ‘C’ words which develop when children feel this way: Communication, Collaboration and Cooperation. Creativity: we need to include activities which develop creativity, fantasy and imagination that are so much part of the world of primary-aged children and can lead to positive new learning. Educational and cultural context: your country, or region in your country, and whether you’re working in e.g. a mainstream school, a bi-lingual school, or a private language school. Methodology: your approach to teaching and learning e.g whether whole class teaching or a more individualised approach. Materials: whether you’re using e.g. a language course book or subject-based materials. Curriculum: how this is organised and the way objectives and learning outcomes are specified. Evaluation: how this is carried out, including the assessment of children’s learning. Which ingredients of the C-Wheel are most relevant to you? Are there any things you would like to change or add to the C-Wheel? It would be great to hear! Happy Teacher´s Day! (at least in Cantabria it is). All the ingredients in the C-Wheel are relevant to any teacher, I assume. As a teacher of Cto. del Medio or Science in Primary, the integration of content and language learning is vital. These implies the interaction of three basic elements: subject matter, thinking and language, which in other words, means the integration of learning (Content and Cognition) and language learning (Communication and Culture) . This is the famous 4Cs Framework to support CLIL pedagogy developed by Coyle, which tries to maximise students´ potential. Your C-Wheel has all of these included, and what we do in Science is to very much focus on Coyle´s ones whereas in EFL we prioritize others. Many thanks for writing and for raising the 4Cs of CLIL and the different emphases we give to different aspects of our teaching depending on whether we’re teaching other subjects, such as science, or EFL. 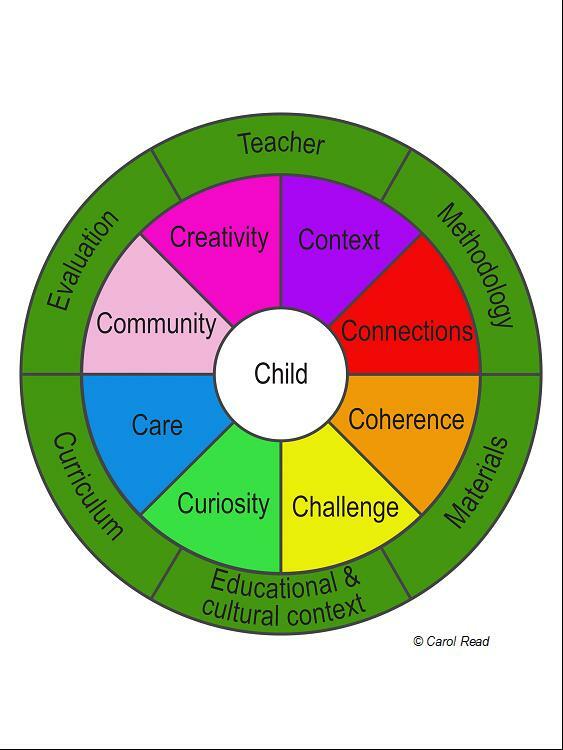 I’ve tended to think that my C-wheel compares to the CLIL 4Cs in the way that content, cognition, communication and culture are embedded in a whole range of considerations about the child’s overall development and needs, and would be very interested to know what you think about this. I completely agree with you that the integration of subject matter, thinking and language is key – and think that this also applies to EFL as well, as we always include some content in our lessons even if this does not come directly from another subject in the curriculum but somewhere else e.g. a topic of general educational interest or a story. As you have experience of teaching both (EFL and science/Cto. del Medio) it would be fascinating to hear how you go about achieving this integration in your science and Cto del Medio classes and how you think it compares and differs from EFL. Yes, you are right. While content is the main aim in our CLIL/Cto. del Medio classes, the effectiveness of this approach relies on the combination of the other Cs (yours and Coyle´s) to contribute to children´s holistic development and needs. As far as the comparison between CLIL and EFL is concerned, yes, you are right again, CLIL is not a new way to learn languages or to learn subject contents. However, I think that the children in my school tend to use more the language in the Cto. del Medio classes (written and orally) and see a purpose for this usage because they have to present a project, for example, about a river in their village or study the climate/weather in their region. They know that fluency is the key issue in “Cono” (as they say) while we tend to concentrate more on accuracy (although fluency is alway present) in the EFL class. At the same time, I also think that the teaching of Cto. del Medio in my school also differs from EFL instruction (in my school there is a group of students that do not follow the bilingual program) in that in Cto del Medio teachers give instructions more clearly and accurately, demonstrate more, use plenty of visuals, rephrase, scaffold and check comprehension constantly, etc, because we are more aware of changing not only the means of instruction but also the methodology… I see the Cto. del Medio classes more learner-centred and less teacher-talking ones. – lessons are more learner-centred. It feels to me very strongly that all these things are also what we should be aiming to achieve in our language lessons too! And in a way reflects the thinking that essentially underpins the C-Wheel i.e. that we need teach the child first, and the language second, and not the other way round. It would be great to hear how your children cope with the language demands of the ‘Cono’ or science curriculum. From what you say I get the impression they find the focus on fluency quite liberating but does it have a downside too? It would also be wonderful to know what anyone else thinks! Please do share! Regarding the disadvantages of focusing “too much” on fluency without attending to grammar, we might run the risk that students speak and write a fluent but ungrammatical English, a kind of pidginized ESL . a more structured approach might be better. A thing to add to the C-Wheel: Co-evaluation (peer assessment). Thanks for pointing out these two possible disadvantages which I completely agree with and which highlight the need for very carefully structured language support and also the fact that content-based instruction through English doesn’t necessarily suit everyone. Although it’s not the whole answer by any means, I think (hope) that the current trend to include much more content from other areas of the curriculum, such as science, in primary ELT courses will go some way towards helping prepare children for the language demands of doing other subjects through English. Given the CLIL trend (at least in Spain) there seems to be much more awareness and attention in language courses these days to the development of cognitive as well as communicative skills, and this can complement and underpin work children are also doing through English in other subjects. Many thanks also for your addition to the C-Wheel which is a great idea and which I’ll definitely include from now on! This is a fascinating dialogue. Thank you Carol and Ricardo. I agree that we can use a ‘C-wheel’ or the Coyle 4Cs framework to ‘develop awareness and understanding of ways to create optimal conditions for children’s learning’ but what also interests me is the key competence framework used in Catalonia and elsewhere which describes transferable skills across the curriculum. These competences (another C?) encourage teachers to look at knowledge, skills and attitudes in all school subjects. They are divided into communicative, methodolgical, and personal and social competences and within these there are highly relevant sub-divisions. This pulls teachers away from concentrating too much on one subject, one language and leads them to addressing a broader basis for child development such as artsitic, mathematical and learning to learn skills as well. I think that the fact that there is no “one person-one language” principle at most Spanish schools implies that we (teachers and students) understand and accept that at school there are different contents and situations, and the usage or switch of languages is something normal and realistic. We do the same outside school -speak different languages with different people and in different situations. In fact, the knowledge of concepts and the cognitive development students make can be transferred from one language to another, although there is concern over specific vocabulary. Regarding the key competences, I think that the integration of different languages aims at (and this is particularly important for younger students) providing students with a holistic perception of the world rather than a fragmentary one. To me, the “key” issue of the key competences is that students be able to integrate “know” and “know how to do” (theory and practice). Unfortunately, in Spain we have focused too much in the acquisition of knowledge per se. Now, this “new” integrated way of understanding contents (combination of theory and practice in a diversity of contexts) which goes beyond the isolated treatment of contents (conceptuales, procedimentales and actitudinales) tries to emphasize that knowledge is necessary, but not by itself, but as the foundation to be applied in a real life situation. This is what the “Prueba de Diagnóstico” in Primary Year 4 goes after in Spain. Interesting comments made, which encouraged me to look for some of the points you were raising in the CLIL literature Ricardo and Kay, thanks for that! Especially like the key competences Kay, can you share some references? Culture is another important C, you’ve mentioned it too. I’m not necessarily thinking of culture as ‘the customs of a particular nation’, but instead to take into consideration individual learning cultures. Here in Portugal, where teachers are specialist peripatetic teachers, we encouanter varied classroom cultures, depending on how children’s ‘other’ learning experiences have shaped their learning culture. As English teachers we need to be sensitive to this and adapt our own approaches. We can’t assume that how we teach English will be understood by other teachers and parents, so making this clear is really important. Confidence is another C I always like to include. Yes, enabling children to feel confident in their abilities, but also to encouarge teachers to feel confident about what they are doing. Keith Sharp wrote an article called Communication, culture, context, confidence: the four Cs of primary modern language teaching Language Learning Journal, Volume 6, Issue 1 September 1992 , pages 13 – 14. It’s an interesting article and well worth reading if you can access it. C is an amazing letter, there’s so much to include! Thank you so much for these pearls! It feels wonderfully enriching to exchange and share ideas like this. Kay – thank you very much for your invaluable insights and for raising the key competence framework used in areas of Spain with transferable skills across the curriculum. Thanks also for describing the way this helps to avoid an over-focus on a single subject or language and address broader issues such as learning to learn. In my original C-Wheel, although not included in the summary here, I have ‘learning to learn’ as part of ‘Connections’ in the sense of making connections between the ‘what’ and ‘how’ of learning, but I can see this doesn’t reflect the fluidity and breadth of the framework you describe with communicative, personal, social competences covering all curriculum areas. I feel there’s a very strong case for adding C for Competences to the C-wheel so many thanks for suggesting that. Ricardo – thanks so much for building on what Kay says so richly and for pointing out the way the framework builds on the deeply resonant principle in Spain, and elsewhere, that there is no such thing as one person, one language and that cognition and concepts develop across the different languages children use. I also completely agree with you about the tension and balance between ‘know’ and ‘know how to do’ being key – and in a way I think this accounts for some of the appeal of doing other subjects through English because it’s not about displaying knowledge of the language as such, but rather using it as a vehicle to apply to the real world and to do purposeful things in the way you mentioned several messages back. Sandie – thank you so much for joining in, especially as the C-Wheel is so familiar to you already! It’s also great to know that you refer to it with teachers. You’re right that I developed it some time ago (was it really 1999?!) but when it came to choosing a C-word for this ABC, it just felt like a natural choice in order to raise some general issues related to children’s learning rather than focussing on just one – but sorry if it’s felt like old wheel (or hat)! Thank you so much for pointing out the need to take into account the children’s learning culture. I completely agree with you that this is vital and something we need to be very sensitive to (and can be hard to deal with especially if we’re unfamiliar with the children’s culture ourselves or, as you say, in the case of many teachers in Portugal moving from school to school). The importance of making our approach clear to teachers and parents also links back to aspects of the previous discussion on behaviour where we also talked about the value of keeping parents involved and ‘on board’. Many thanks also for supplying the reference to the Keith Sharp article – and yes, confidence is definitely another candidate for inclusion! I agree C is an amazing letter! Any others you’ve thought of?! I think the C-wheel is a superb framework and I have used it extensively since I attended a Primary Teacher Training course at British Council Paris, led by Carol and Gail Ellis in 2005. As a teacher trainer (and now an assessor) on the Cambridge ESOL YL Extension to CELTA course, I often found courses to be rather fragmented and ‘bitty’ without an over-arching approach for trainees to frame their teaching and to ensure children’s language learning remained ‘whole’ during teaching practice classes. Since I started introducing the C-wheel in the very first input session, I have found teachers now have a scaffold for course and lesson planning and it has also provided a useful tool for shared dialogue during post-lesson feedback sessions. Coherence is a particular ‘C’ that I feel needs much more attention in many YL courses. I have observed many lessons that are collections of fun but fragmented activities with no real thread or learning outcomes. I’d suggest that this can be attended to during courses such as the YL Extension and other in-service development programmes by having trainees plan courses together to ensure they have clearly linked threads running through each lesson. This ensures that YLs’ learning remains enjoyable but far more purposeful with some real development -both linguistic and non-linguistic. By referring back to the C-wheel when reflecting on lessons, this gives us a shared understanding of the key ingredients of successful whole learning. Thanks very much for developing the C-wheel Carol, I believe it has made a great contribution to our work. I also like to use the C-wheel in my teacher training. I find it serves as a great opener for reflection. Lately, I have been working a lot on technology and I have been asking my “charges” to look at the wheel and think about how/if/when technology fits in. Many thanks for your comments and insights on the C-Wheel and great to know that you’ve found it useful in your teacher training work. David – that’s really interesting that ‘Coherence’ is one of the Cs that resonates with you and that you feel needs more attention on training courses. I agree very much with what you say – there is a danger of YL lessons sometimes becoming ‘rag bags’ of activities such as songs, stories, games etc without much coherent development or leading to clear learning outcomes, and in teacher education we really need to work to ensure the ‘clearly linked threads’ you mention. Gordon – what a great way to use the C-Wheel to apply it to technology! Thank you so much for sharing this idea. I’d be fascinated to hear some of the things your ‘charges’ come up with! I can see, for example, that ‘Connections’ might be something to do with ‘connection literacies’ that I read about recently, and which is about how you connect to different networks and participate in and influence those networks e.g. I guess the kind of thing you do when you interact on a blog or use facebook or twitter. Would be really interesting to hear more of your thoughts on how a techno-version of the C-Wheel would work. Apologies for coming into this discussion months late, but I have to wonder whether or not the concept of “coherence” as articulated by David is somewhat overrated as a lesson planning attribute, especially for young learners? In any case, thank you for providing a very thought-provoking blog filled with genuinely useful information. Many thanks for joining this discussion and for your interesting and thought-provoking comments. I can see what you mean about coherence being an overrated attribute if interpreted along the lines of an industrial, manufacturing metaphor of education (cf Sir Ken Robinson) with everyone being artificially led in a linear way towards the same learning outcome. But perhaps coherence is a relevant and valuable feature using an organic, agricultural metaphor of education (again direct from Sir Ken Robinson) as well if we interpret it to mean that the conditions for individual, personalised learning to take place need to make sense, relate to each other and be in some way part of a whole. Very interesting what you say about a single lesson being too short a frame of reference to worry overly much about coherence. In a way I think this is challenging one of the assumptions I probably take for granted – a bit like wearing a watch (again cf Sir Ken) so thank you very much for doing that! I think this is a really valuable point and that if we believe in an approach that engages the whole child and works towards individualized personal learning outcomes then we need to seriously examine the process and procedures we use to get there and question any kind of lockstep progression or over-riding coherence that makes one size fit all as it were. Many thanks again for writing and also for your positive comments about the blog – I’m so glad you find it’s useful. Just to clarify my standpoint on the crucial nature of coherence in TEYLs… I am definitely not an advocate of linear progression in ELT. I am firmly against the usual structural syllabuses underlying many YL (and adult) coursebooks and advocate crafting lessons and courses grounded in the young learners and their specific cultural contexts. I favour story-based courses using authentic children’s literature, task and content-based instruction. My emphasis on coherence is to safeguard against lessons which are purely activity-driven and focus more on ‘filling in time’ and playing games without any real learning objectives behind them. I strongly believe YLs should have lots of fun and enjoyment during their language lessons, but at the same time we have a professional obligation as language teachers to develop their English. This is what parents / carers and schools expect and (especially as children reach upper primary) often the YLs themselves. Purposeful learning (which is fun and action orientated) in my experience, provides children with a sense of security. They can anticipate a lesson shape (while still retaining plenty of variety), feel comfortable in the classroom environment and participate fully in the various connected and inter-related sequences. I completely agree that we need to respond to our young learners and enable them to personalise the materials and the language. That said, I equally believe that we need much more than a collection of fun activities in our repertoire. I also write from my perspective as a teacher trainer on the Cambridge ESOL Young Learner teaching award, which requires certain criteria to be met. Whether we believe that criterion referenced assessment in teacher education is appropriate or not, I have witnessed superb transitions in the abilities of English language teachers who were initially adult-trained moving to the young learner classroom as a result of this course. It is certainly positive and useful to question our beliefs regarding what makes learning coherent and whole for children, but for me this really doesn’t equate to linear education nor a structural approach to language teaching. Great to see you back here again! Many thanks for your comments and for clarifying and expressing your views so cogently. I completely agree with what you say – in particular your point about safe-guarding against YL lessons which may be a collection of fun activities that fill the time but don’t have clear learning objectives or outcomes, and the obligation and responsibility we have towards parents and carers – and I’d also add the children themselves. Thanks also for sharing your perspective as a YL teacher trainer for the CESOL YL teaching awards – the ‘superb transitions’ you mention resonate very much with work I’ve done over the years “converting” (sounds like a change of faith!) adult-trained teachers to work with children too. I also completely agree that the concept of coherence doesn’t equate to linear education or a structural approach. That’s what I was trying to get at I think in my response to Matt by associating the concept of coherence with Sir Ken’s organic, agricultural metaphor of education and not just his industrial manufacturing one. In the agricultural metaphor there would still need to be an overall coherence but with many different personally coherent learning paths followed by individual children according to their needs, abilities and interests etc.. With increasing use of technology and fast-changing patterns of learning I tend to think this is what is increasingly happening anyway, at least in the leisure side of children’s lives, and as educators we need to adapt (fast) to the new realities. The challenge seems to me to be to create that overall coherence within which flexible and genuinely individualized learning paths, which are coherent in as many ways as there are children, can also be followed. Or is that just a pipe dream?! I wonder what you think about this. Many thanks again for writing and for your great contribution. My original comment was more about how we define and especially measure in a systemic way the component of teaching the term is supposed to encapsulate than questioning the need for clarity of purpose in our instructional practices. According to the dictionary, applicable definitions of ‘coherence’ in this discussion include: cohesion; logical interconnection; consistency; overall sense of understandability. I do wonder in how many places around the world the term ‘coherence’ is functionally understood to mean absolute fidelity to the lesson plan and syllabus, with deviation being highly discouraged. Although it’s nice to hear David saying he’s not in favor of linear education or structural approaches to language teaching, I suspect in actual practice around the world the trendlines rather strongly point the other way. I do think criterion based assessment is appropriate in any organizational context, and in fact in many environments it’s a legal requirement. As a general comment without reference to CESOL YL, however, it is my experience the danger in any evaluation system is the sense of “false precision” that is created about what the data collected actually means. And when used in a formative way, such as in a classroom observation to identify strengths and areas for improvement, the consequences of too much specificity tied to individual lesson outcomes instead of the strategic outcomes may be to drive teacher behavior away from innovation, risk-taking and trying to genuinely personalize the educational experience for students, and towards what best “games” the assessor and evaluative process. It does get easy to lose sight of the bigger picture. To be fair, I have seen the matching of measurements to desired results done really well. However, in pretty much every case, the evaluation process was simply of reflection of all the other excellent things those entities were doing from top to bottom in terms of creating and managing their organizational spaces. I don’t have any direct experience with CESOL YL, but I suspect David having witnessed many superb transitions in teachers is probably the result of the consistent application of fundamental principles across the board. An approach that’s gaining a great deal of traction in the United States- and the most “coherent” approach to individualized learning I’m aware of- is called the Universal Design for Learning.